Just attending the vernissage for a couple of excellent new shows at the San Jose Museum of Art. It was a bit of a drive from my San Francisco homebase but both exhibitions were well worth the gas and time traveled to get there. 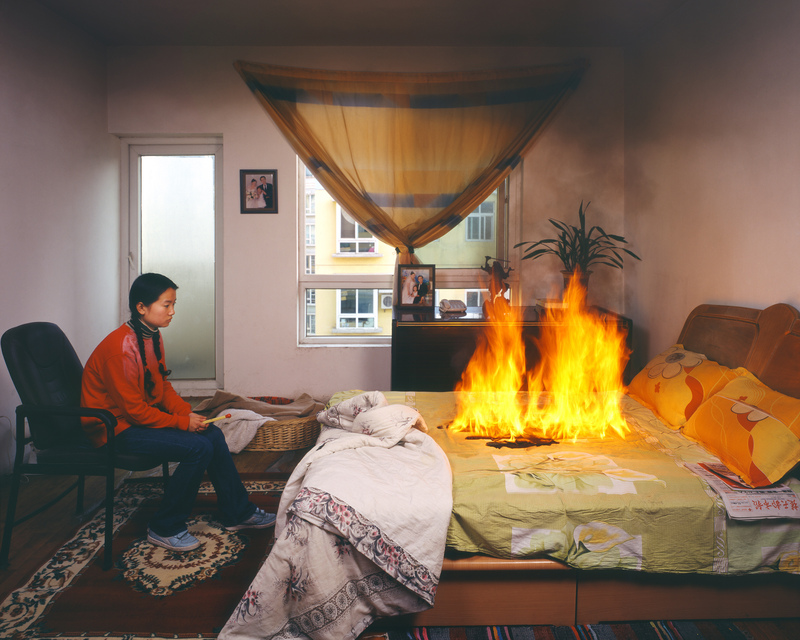 Rising Dragon: Contemporary Chinese Photography is a survey of work from Chinese artists that looks at the rapidly changing social, cultural, and political landscape of the world’s most populous nation. As I was just in Southern China last fall I was particularly looking forward to seeing the show, and it didn’t disappoint. Ranging from street photography to portraiture to manipulated digital images, the show is a good cross-section of recent work that includes artists from urban centers such as Beijing, Guangzhou, and Shanghai as well as those from farther-flung provinces like Sichuan and Fujian. Much of the work in the show addresses China’s rapidly changing society, looking at toxic waste, overdevelopment, industrial pollution, westernization, cultural appropriation, and the reclamation of Chinese history and culture amidst the onslaught of modernization. Several of Rising Dragon’s artists deal head-on with China’s environmental degradation and destruction. 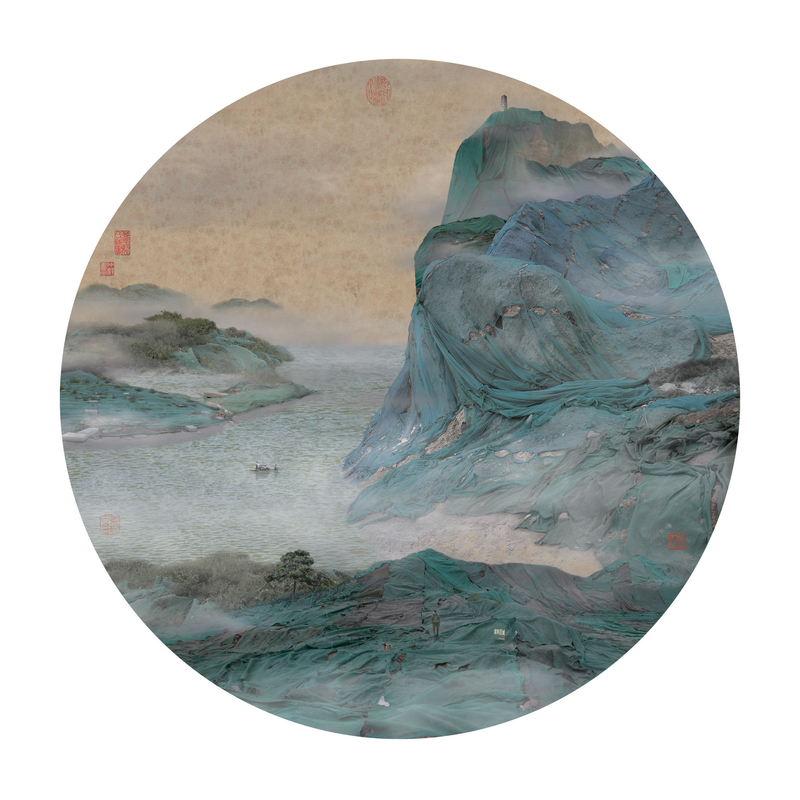 Yao Lu’s New Landscapes series depicts what at first glance appears to be traditional Chinese landscape paintings, with pastoral scenes of mountains enshrouded by mist and clouds. Upon closer examination, however, these images turn out to be photographs of the massive mounds of garbage covered in green netting that can be found throughout China. Similarly, Wen Fen’s series Sitting On The Wall documents the impact of China’s accelerated urbanization. Shot in the same location over the course of more than a decade, Wen’s photographed a schoolgirl sitting on a wall overlooking the once-distant Haikou cityscape. As the years pass the skyscrapers become larger and move closer to the girl until the wall is torn down and the nearest building sits right on the edge of the frame. Liyi + Liubo’s photographs take a more whimsical look at China’s social landscape, with their staged tableaux inspired by headlines from China’s infamously sensationalist tabloid newspapers. Self-explanatory titles include Failing to Steal Anything, a Thirteen-year-old girl Sets Fire to Classmate’s Home; Karaoke Hostess Forced To Drink Intoxicant, Now Under Police Investigation; and An Escapee Being Chased Dropped Through The Top Floor of a Building and Scared Everyone. An unintended irony of the exhibition is the siting of Rising Dragon in Silicon Valley—the high-tech industry has outsourced much of its manufacturing to China, thus possibly contributing to the overly rapid industrialization that has lead to the destruction of China’s environment and the breakdown of its social structures. By addressing these and other aspects of 21st-century China, the show is a good primer on new photography from that country and demonstrates the ongoing vitality and innovation of its art scene. 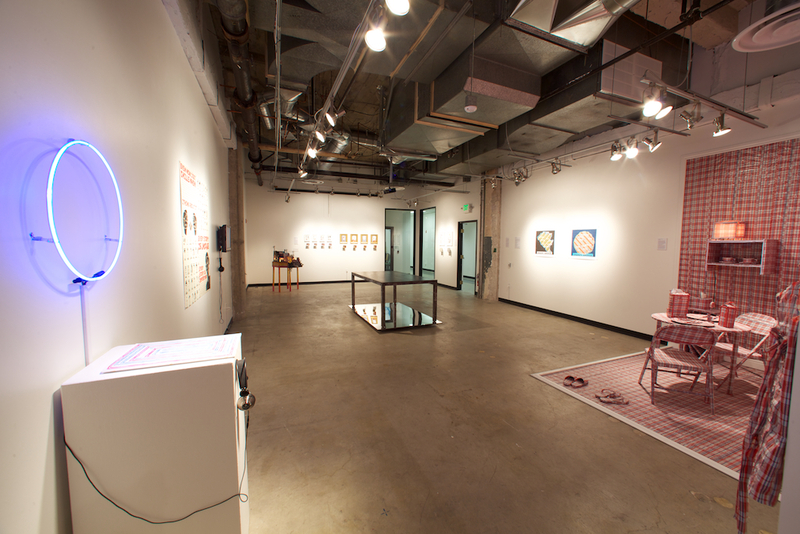 Also on view at the SJMA is New Stories From The Edge of Asia: This/That, a show of Asian American artists organized by SJMA’s senior curator Monica Ramirez-Montagut. 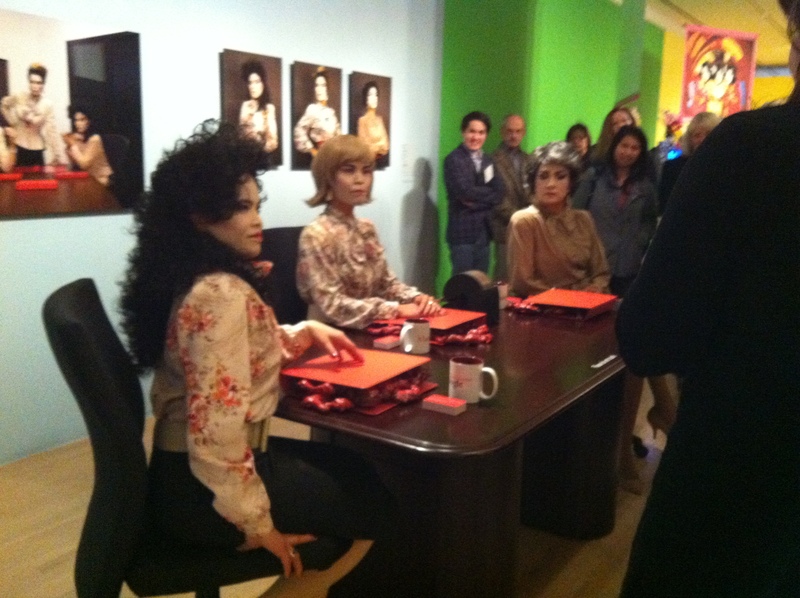 Included in this exhibition is a mini-retrospective of work by San Francisco’s own MOB/Mail Order Brides, aka Jenifer Wofford, Eliza O. Barrios, and Reanne Estrada, aka Baby, Neneng, and Imaculata. The MOB were there in person to introduce their newest project, Manananggoogle, that links the world of Silicon Valley women with the manananggal, the Filipino mythological creature that, among other things, eats the hearts of human fetuses. The MOB attempt to reclaim the myth of the manananggal by parallelling its often-misunderstood image with misogynistic stereotypes of female corporate executives. As always, the Brides exploit their singular brand of humor, irony, and cosplay to examine what it means to be pinay. 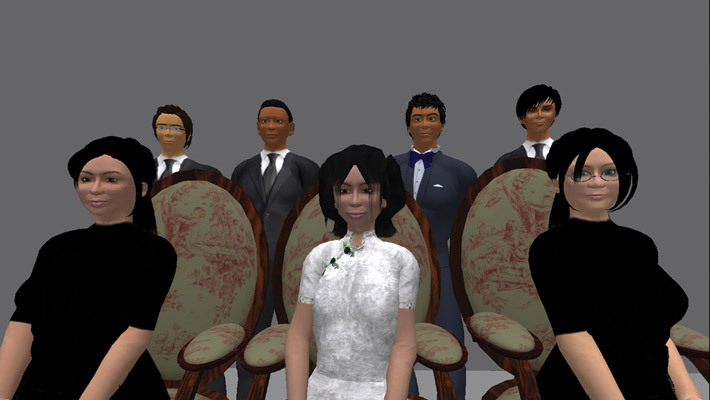 Also notable is Landless In Second Life, Tran T. Kim-Trang’s three-channel video project that utilizes the popular online platform to look at biculturalism and filial piety. In a kind of virtual version of hell bank notes, Tran builds an online dream home for her deceased mother, populating it with avatars from her immediate family and with icons from both the U.S. and Vietnam. The show also includes an installation of The Heart’s Mouth by Erica Cho, a sleek narrative film about love, gender, and identity, and some of Mike Lai’s continued explorations of his Bruce Lee fetish. This included a performance piece during the opening reception that pitted Aztec dancers against Lai’s oversized Bruce Lee Fists of Fury puppets in a volleyball/dodgeball tournament played out on a floor-sized map of the United States. All in all the two shows nicely complement each other. Each deals with culture, politics, identity, and race from both sides of the Pacific, with wit, style, and humor. I recently made a trip to our nation’s capital and caught Portraiture Now: Asian American Portraits of Encounter at the Smithsonian’s National Portrait Gallery. Although there have been a few significant Asian American arts shows in the past few years at major institutions (including One Way Or Another at the Asia Society in 2006 and Asian/American/Modern Art: Shifting Currents at the deYoung Museum in 2008) and Asian American community arts organizations like Kearny Street Workshop have been going strong for more than forty years, Portraiture Now is a coming-out of sorts for Asian American artists since it was organized by the Smithsonian aka this country’s big-time cultural gatekeeper. Just downstairs from the Annie Leibowitz show and up the hall from Leutze’s Washington Crossing the Delaware, the show had a nice primetime location on on the NPG’s first floor, and it included some good stuff by mostly younger artists that moved beyond classic ideas of representation. Self-portraiture figures into several of the artists’ work featured in the show. Tam Tran’s funky and intriguing photos of herself make good use of her unusual physicality and a fish-eye lens. Despite their prettiness, Zhang Chun Hong’s meticulous charcoal drawings of hers and her sisters’ hair become observations about the fetishization and objectification of the female Asian body. Hye Yeon Nam’s four-part video self-portrait, Walking, Drinking, Eating, and Sitting, something of a throwback to early lo-fi 1970s video art by Joan Jonas and Vito Acconci, uses absurd and repetitious actions to convey everyday life’s ongoing anxiety. With their sleek surfaces and liberal use of gold leaf, Shizu Saldamando’s paintings of LA baby-dyke scenesters recall both medieval illuminated manuscripts and Japanese folding screens. By treating these images of her friends as semi-sacred iconography Salamando’s portraits combine the earthly and the sublime, capturing and elevating the everyday camaraderie of her crew. CYJO’s KYOPO Project, a series of full-length, full-color photographs of more than 200 Korean Americans, features text in their own words detailing the subject’s relationship to their Korean American-ness. At the NPG the photos were mounted one after another down the length of two walls and seen this way the entire series makes for an impressive collective portrait, with the personal stories adding humor, complexity and nuance to the project. The venerable Roger Shimomura represented the older set, with his reworkings of Pikachu and Hello Kitty demonstrating his continued awareness of the ironies of U.S. cultural representations. 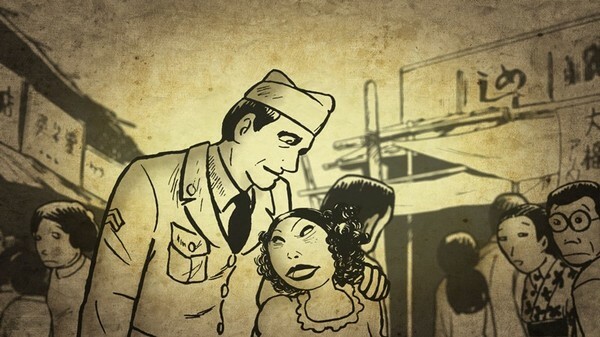 Americans vs. Japs, is a clever rendering that locates Shimomura’s (Japanese) American visage amidst a hoard of invading Japanese stereotypes borrowed from World War II propaganda. The painting shrewdly interrogates assumptions about Asian American identity in Shimomura’s signature style, blending classical Japanese brush paintings with U.S. pop culture iconography. 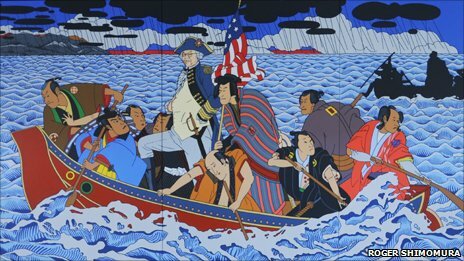 The show also features his epic painting Shimomura Crossing The Delaware, which is at once a display of Shimomura’s technical mastery, a cogent critique of American pop history, and a brilliant goof on its source material located just down the hall in the NPG. While I was on the Mall I also stopped in at Colorful Realm: Japanese Bird-and-Flower Paintings by 18th-century painter Itō Jakuchū. On loan for only four weeks from Japan, the show includes some truly legendary paintings that in Japan are the equivalent of the Mona Lisa or The Last Supper. The show was packed four-deep with people on a Saturday afternoon, with a line to get in and a brisk sale of related prints, books, and postcards in the museum gift shop. In contrast, the Asian American NPG show was much more lightly attended, with plenty of room to sit and ponder the intricacies of meaning of each piece in the exhibit, but despite losing the popularity contest to the Jakuchū show’s more conventional appeal, its mere presence in the NPG, the first pan-Asian American show at the Smithsonian, surely recognizes the artistic and cultural relevance of Asians in the U.S. The spiffy National Museum of the American Indian on the Mall opened across from the National Gallery in 2004 and the National Museum of African American History and Culture just broke ground in February 2012. The Asian American population is currently more than 5% in the U.S. and former UH Manoa professor Konrad Ng (aka Barack Obama’s brother-in-law) now heads up the Asian Pacific American Arts division of the Smithsonian. So this begs the questions: when will we Asian Americans get a national museum of our own? If the existence of high-profile Asian American art shows like Portraiture Now and the growing Asian American demographic are any indication, it seems to me that the time is now. Today is the third anniversary of the launch of this blog as well as being my birthday, and this year I got an early birthday present. About three weeks ago I was notified that I’d received a Creative Capital/Andy Warhol Foundation Art Writer’s Grant for this little ongoing online experiment (along with a nice cash prize that will ease the pain a bit in the coming year). Although I didn’t start out writing about visual arts or activism those topics have become pretty significant elements in the blog, so it’s great to get some recognition from organizations like Creative Capital and the Warhol Foundation. Needless to say there aren’t a lot of places to go for support, monetary or otherwise, for either blogging or writing about art so it’s awesome that someone is giving it up for us art bloggists. Back in the day when I started out as a fledgling artist there was a reasonable amount of funding, both public and private, for artists, experimental filmmakers, and other folks working in the creative arts. Very few people actually made a living from grants and fellowships but there was enough modest funding out there that a person had a decent shot at getting a few bones for a short film, a performance piece, or some time in the studio. Although I didn’t rely on grants to do my art I received enough support to help me make the work—when I was fresh out of grad school I got $1,500 from the Film Arts Foundation to make my next experimental video, which absolutely gave me the encouragement to continue in my artmaking endeavors. I subsequently got some shekels from now-defunct granting organizations like the Rocky Mountain Film Center, Art Matters, and New Langton Arts, all of which in turn had gotten some federal funding to support their grants programs. Not that I advocate a complete dependency on feeding from the public trough in order to create artwork, but in many ways those little bits of money here and there were just enough to keep me going and to help me to finish some projects than I otherwise might not have had I gone without. But in the twenty years or so since my days as a young artist public arts funding institutions like the National Endowment for the Arts have been under constant attack by Republican philistines such as Sen. Jesse Helms and his minions. At its height in the 1990s the NEA’s total budget was about $190 million—peanuts compared to the Pentagon’s 1994 budget of $240 billion, but even back then the right-wing clearly understood the threat to their master narrative that unfettered arts funding posed. The NEA’s 2009 budget was $160 million, which is about $92 million in 1990s dollars, or less than half its 1990 budget. This reduction has in turn has created a domino effect on arts funding large and small. I sat on the Board of Directors of two different media arts organizations (both of which in their heydays in the 1990s had memberships in the thousands) that have in the past decade become defunct due to greatly reduced federal, state, and private arts funding in this country. Although the worldwide economic recession and the end-times of late capitalism have contributed to its decline, the right-wing’s vendetta on the arts has certainly played a huge part in the atrophy of its funding in the U.S. It’s no secret that the Republican Party has been gunning for arts funding for decades since, unlike the left, it totally understands the significant role that culture plays in shaping public opinion and framing the national debate. So it’s great that Creative Capital and the Warhol Foundation continue to stand up for fringe elements like arts writers and other troublemakers who insist on stirring things up and questioning the status quo. Their support is a small but significant salvo in the continuing ideological war for this country’s cultural heart and soul. After World War Two Japan was a wreck, economically, physically, and psychologically, yet from those unquiet times came much brilliant and innovative creative work. 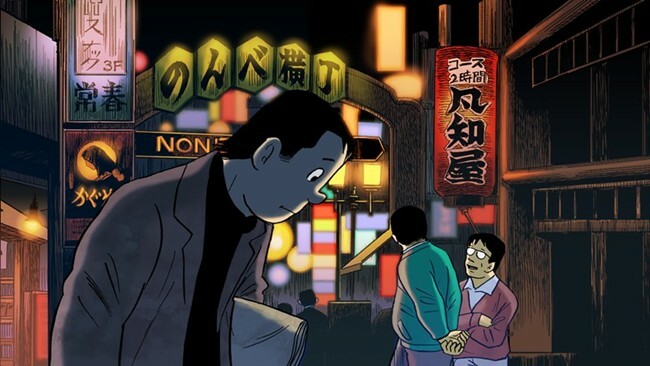 The legendary Japanese comics artist Yoshiro Tatsumi emerged from this milieu, remaking the manga field and creating a new type of comics, gekiga, that was aimed at the adults rather than children. 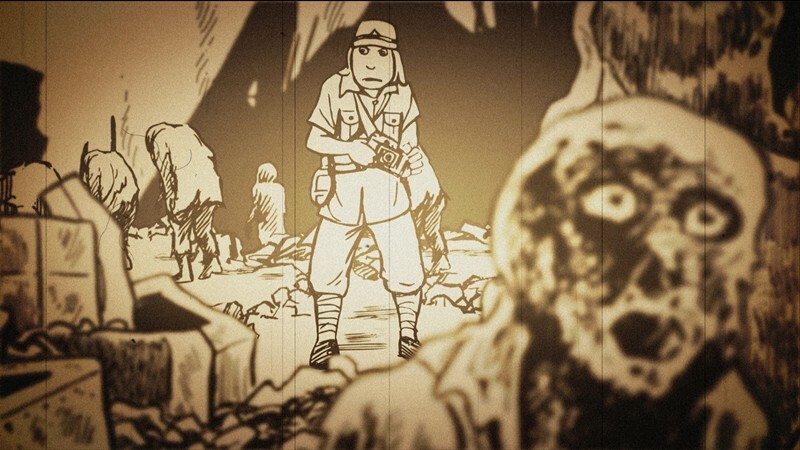 Tatsumi, Eric Khoo’s intriguing feature-length documentary about the master comics artist, screens this weekend as part of the San Francisco International Animation Festival. The film is an interesting hybrid as it both documents Tatsumi’s life as well as adapts several of his manga into short movies with the movie. Tatsumi’s raw and gripping, beautiful manga are credited with revolutionizing the form in Japan in the 1950s. Post-World War Two Japan provides the backdrop for his stories and the spectre of a destroyed society attempting to rebuild constantly informs the tone of the work, with sorrow, inhumanity, and alienation the overriding themes. The five short stories animated in Tatsumi are mostly dark tales of human suffering, with protagonists who grapple with oppressive forces beyond their control. “Hell,” which looks at the horrors of the atomic bomb as well as the darkness within one person’s soul, “Beloved Monkey,” a parable about an ordinary man’s descent into misery and “Good-bye,” a tale of an emotionally and physically traumatized woman in postwar Japan, are all terribly sad and yet deeply compassionate stories. At the same time Tatsumi’s stories are leavened with a dark humor that acknowledges the foibles of everyday human existence, most notably in “Occupied,” a black comedy about a children’s book author with a taste for pornographic graffiti who falls into moral disgrace. Khoo skillfully interweaves these bleak and sometimes harrowing tales with dramatized animated scenes from Tatsumi’s life that in some ways parallel the grim despair of his manga. Although he found some success as an artist as a young man, Tatsumi still grappled with the difficulties of everyday life in postwar Japan and his early career was shadowed by a jealous, bedridden brother who also had artistic aspirations. Khoo worked closely with his subject on several aspects of the film, consulting with Tatsumi on the film’s color design and other elements of the project. Khoo also used a voiceover of Tatsumi himself recounting his life and work that is laid over animation based on the renowned artist’s visual style. In addition, Khoo took most of movie’s framing directly from the original manga panels, adding some layering and coloring effects but otherwise remaining true to Tatsumi’s compositions. The result is an engrossing look at one of Japan’s most influential twentieth-century artists, one who used a popular medium to comment and reflect on some of the painful realities of Japan’s postwar existence. Tatsumi’s work is an excellent example of the way in which pop culture can serve both as a catharsis for and a critique of society’s ills. Full schedule, film descriptions, and tickets here. 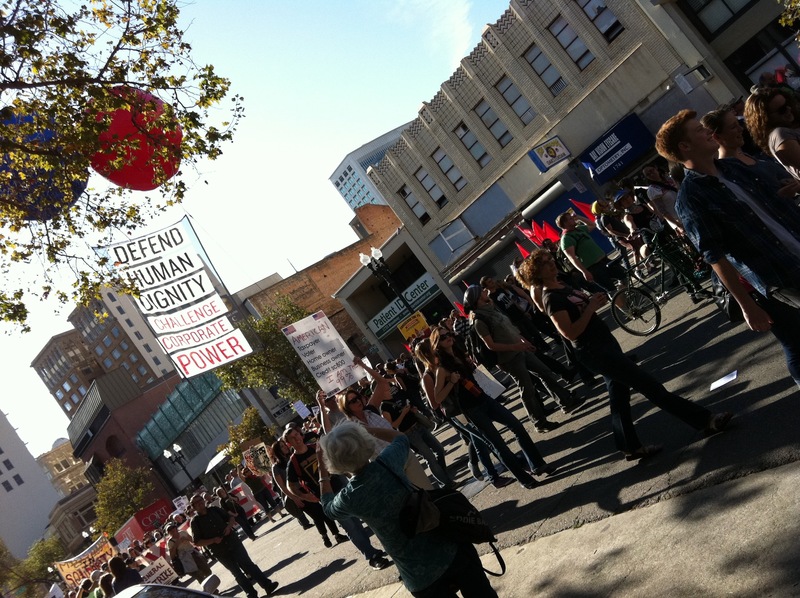 Nov. 2, 2011: Spent a good part of the afternoon at the general strike demonstrations in Oakland today. I’d fully meant to get in a good day’s work editing my new film but once I got on the twitter feed my good intentions went out the window. The revolution was happening just across the Bay Bridge and I realized that my creative process would probably benefit most from the knowledge that I could glean from what was going on in the streets, not from wrangling with the intricacies of Final Cut Pro. 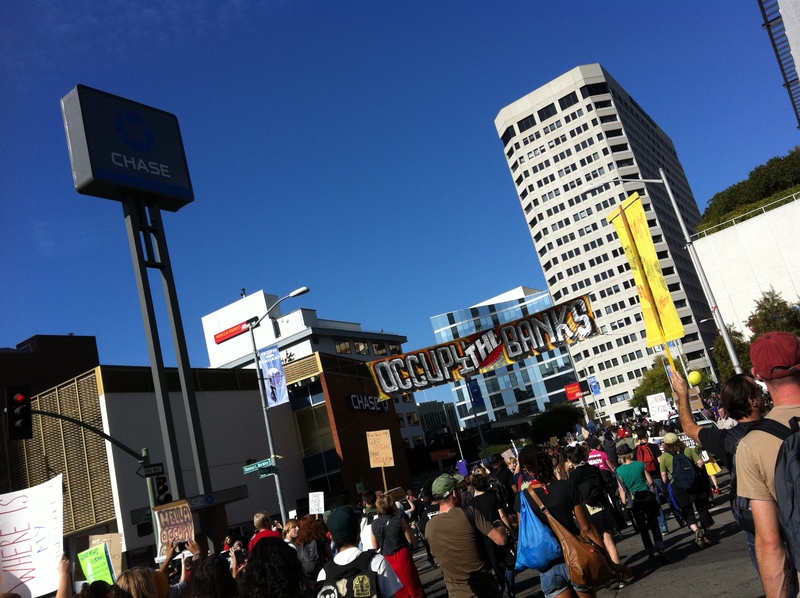 So after sketching out a couple ideas I decided to skive off the rest of the day and head over to Oakland to show my support for Occupy Oakland. As noted in my last post, OO got worked over pretty good last week by the Oakland Police Department, with help from outside agencies including seventeen different regional police departments and a rumored assist from Homeland Security. After that mess the folks at Occupy Oakland’s general assembly voted for a general strike, which took place in spectacular fashion today. We circled back to the main intersection in time to hook up with a large march headed up Harrison Street toward Grand, passing by the Caltrans building where curious workers stood on the sidewalk watching the demonstration pass by. At one point I observed a couple office ladies confer with each other, then gleefully join the march as it continued up Grand Avenue. I headed back to San Francisco shortly thereafter and followed the rest of the protest on twitter as tens of thousands of people shut down the Port of Oakland and effectively prevented any activity there. As I write this around 11pm there are still many hundreds, if not thousands, of people peacefully massing at Ogawa/Grant plaza. The police are keeping their distance, although I’m sure they’re chomping at the bit for any excuse to brutalize the demonstrators. Here’s hoping that things will stay calm, and that this amazing day will continue into the night. 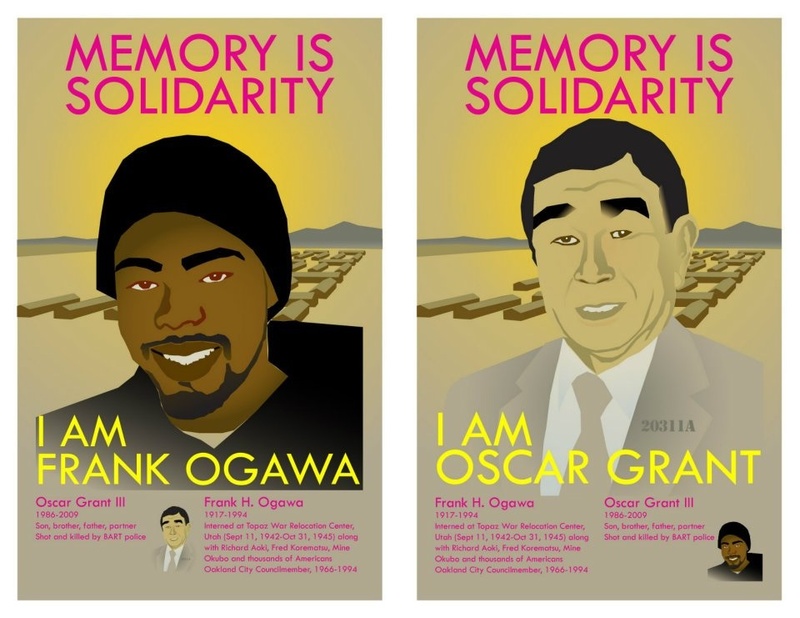 NOTE: Oakland writer and artist Kenji Liu has produced an excellent diptych of posters, Memory Is Solidarity, that connects the dots between Frank Ogawa and Oscar Grant, whose names grace the downtown Oakland plaza that is the hub of Occupy Oakland. He eloquently explains why he thinks that we should remember both Ogawa and Grant, since both were victims of institutional racism–Ogawa was imprisoned at the Topaz internment camp during World War Two, and Grant of course was murdered by BART policeman Johannes Mehserle in 2009. Liu also notes the importance of other significant place-names including Wall Street, which was indeed originally a wall that separated European Americans from the indigenous Lenape people in lower Manhattan. It’s great that the Occupy movement is spawning so much thoughtful and interesting debate–a true sign of a successful campaign. UPDATE 2: 12.14p. 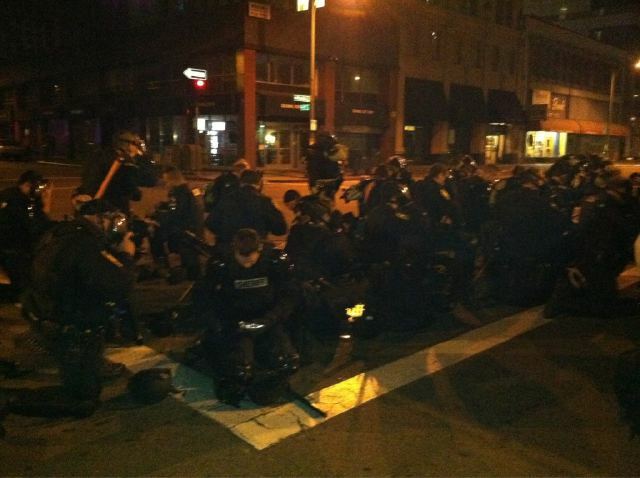 Alameda County sheriffs have just moved on the occupiers in Oakland. Teargas, rubber bullets, and flash grenades being used on protestors. All went down just after the television news crews packed up and went home. Luckily an intrepid cameraman has been livestreaming the entire event. Don’t let this unbridled show of police brutality go unwitnessed. Here’s what I gleaned from the livefeed: Protestors were dancing in the streets just before midnight. Some had occupied a foreclosed building adjacent to the square. A couple hundred police in riot gear arrived and without warning or a dispersal order fired tear gas and rubber bullets into the crowd, which had dwindled quite a bit from earlier that day. Several of the police, who appeared to be from the Concord Police Department among other agencies, had masking tape covering their names and badge numbers. When challenged about this I heard one cop say, “Go home,” to a demonstrator, who then said, “I have a right to peacefully protest.” A hostile bystander then replied, “He has a right to kill you.” When I finally succumbed to fatigue around 1am the police and protesters were still in a standoff. UPDATE 3: OakFoSho has corrected my belief that a cop said, “I have a right to kill you.” Apparently it was a heckler standing nearby who said it. Fixed. You can see the archived livestream, or follow oakfosho on twitter for more information. On a similar tip, here’s a great video of a couple demonstrators who came across an Oakland policeman with his name-tag taped over. We ask a OPD officer why he had his name badge covered…. from BLK PXLS on Vimeo. UPDATE 4: Davey D. from Hard Knock Radio breaks it down in an excellent overview and analysis of the day. UPDATE 5: Great discussion of the turn of events on Thursday here on dailykos.com. 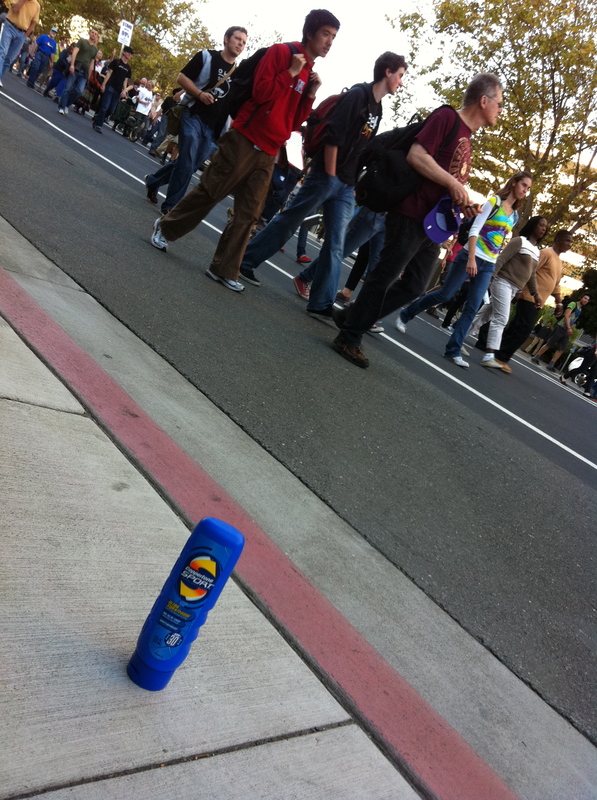 UPDATE 6: The Occupy movement, and attendant police violence, has spread to the UC Berkeley campus. 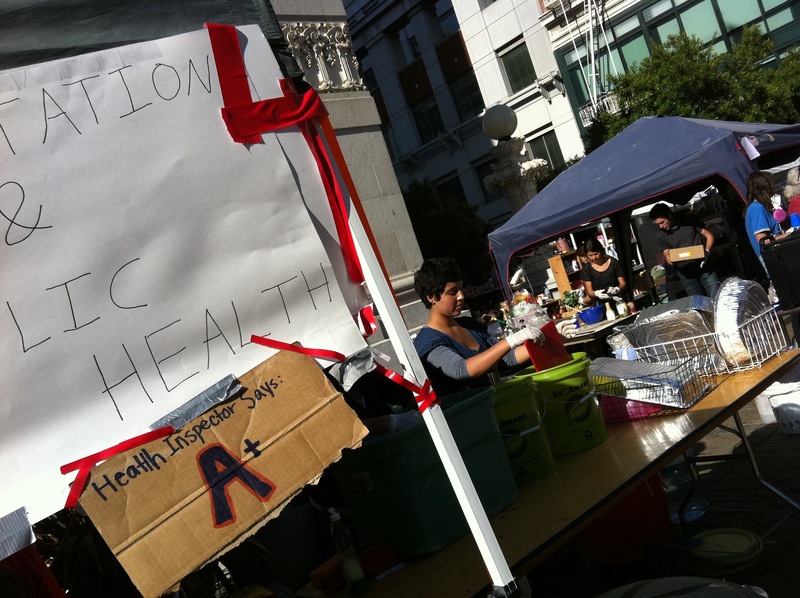 asiansart.org has a great on-the-ground description of the demo yesterday, including videos of UC police beating on peaceful student protestors. Carlos Villa’s beautiful new show, Manongs, Some Doors, and a Bouquet of Crates, at the Mission Cultural Center for Latino Art (MCCLA) is a selective survey of his work, and the show is a great introduction to Villa’s formal, thematic, and stylistic range. The show’s title is indicative of the diversity of the work from Villa’s long career, which has spanned more than seven decades. As Filipino American cultural critic Theo Gonsalves notes, some art historians as well as some Asian American Studies scholars have had a hard time placing Villa’s wide-ranging body of work. As a Filipino American, Villa has never shied from referencing his cultural heritage in his work, most notably in his striking, large-scale cloaks of feathers, bone, shells, hair, and other evocative organic materials. But Villa also has a large body of non-representational pieces that don’t easily fit into culturally specific pigeonholes, which puzzles the more literally minded multiculturalists among us. However, his ability to move easily between culturally rooted work and work that less directly references his cultural background is perhaps what best defines Villa as an Asian American artist. As Stuart Hall famously notes in his essay, Cultural Identity and Diaspora, “Cultural identity is a matter of ‘becoming’ as well as of ‘being,” and the variety of approaches in Villa’s work speaks to that constantly evolving state of becoming. The current show at MCCLA is an excellent example of the broad scope of Villa’s ongoing concerns. Upon entering the gallery at MCCLA the viewer hears a recording of “I Can’t Give You Anything But Love,” sung by manong Freddy, one of the tenants of the original International Hotel who was involved in the long and bitter struggle to save that Manilatown landmark. The audio track immediately locates Villa’s work in Filipino America and reinforces the deep cultural connection that informs all of his work. Other suggestions of Pinoy culture are found in Where My Uncles Went West, a tall, shallow rectangular box with geometric white lines painted on a black background–both the box and the lines resemble doorframes, suggesting the entrances and exits of the immigrant experience. The side panels of the piece also pay tribute to the various journeys of the manong in their travels from the Philippines and throughout the U.S., with inscriptions including “Cebu to Fresno” and “Watsonville from Honolulu” suggesting the travels of first-generation Filipino Americans in their search for itinerant labor. 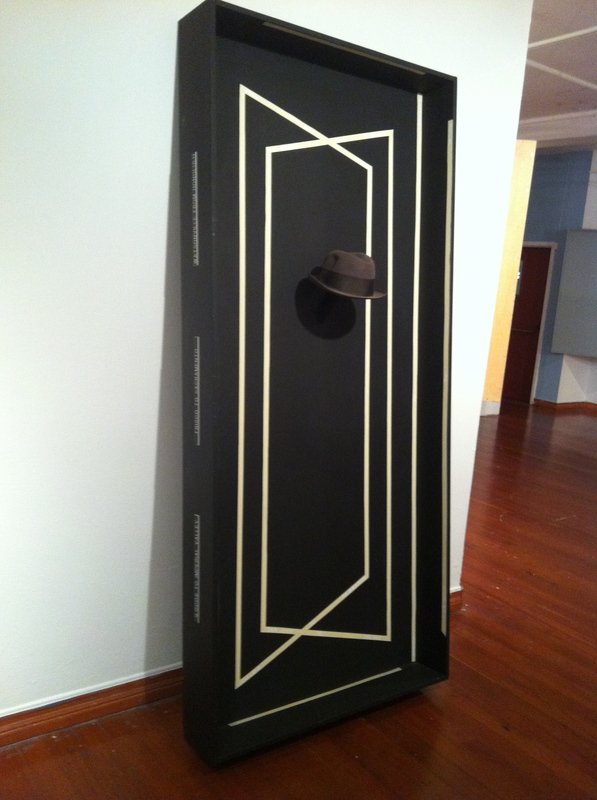 Centered between the door-shaped geometric lines is a porkpie hat, another significant element of manong culture. Here Villa evokes the transitions and translocations faced by those Filipino immigrants from the early 20th century, suggesting both their origins as well as their destinations. The show also includes a sampling of Villa’s earlier work, including some beautiful geometric studies on paper as well as photographs of several plywood sculptures that presage some of the work that makes up the bulk of the MCCLA show. A series of large-scale, hand-built wooden boxes marked with carefully drawn lines on colored backgrounds, this body of work is a good example of the way that Villa’s non-representational pieces echo the concerns found in his more culturally specific work. 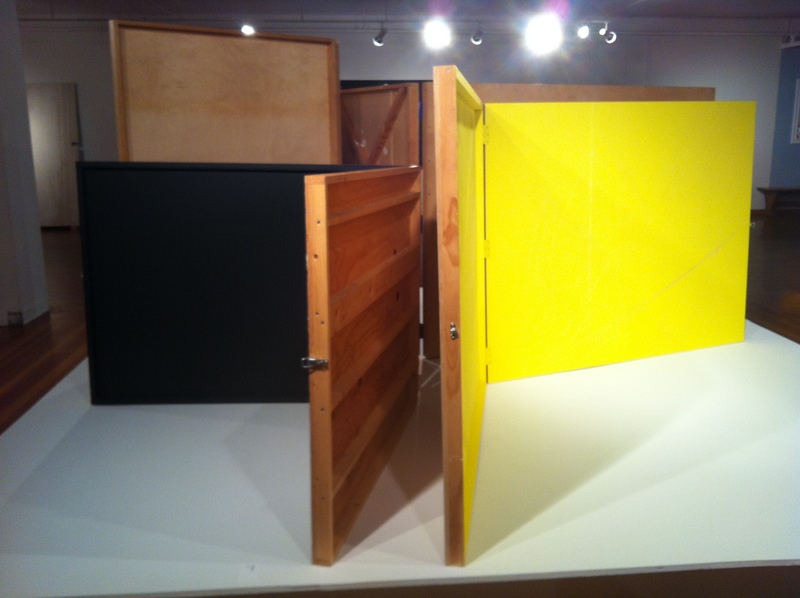 The boxes at the MCCLA show are hinged panels that are displayed in the gallery’s center. The viewer is able to circumnavigate the boxes, seeing both their painted and etched “front” as well as the structural supports of the “back,” thus evoking packing crates, suitcases, and other forms associated with transiency and migration. Beautifully hand-etched with precise, closely spaced parallel lines, these pieces are displayed ajar, both opening and closing, echoing the transitional mindset of many immigrants. Like Ruth Asawa, another great Asian American artist of the same generation whose carefully crafted non-representational work defies easy categorization, Villa is biliterate and bicultural, belonging in many worlds and utilizing a multitude of frames of reference. By refusing to fit neatly into a single, simple classification, Villa’s work redefines what it means to be an artist, a Filipino American, and an American. Join Carlos Villa and distinguished guests for a night of storytelling and dialogue, as we celebrate the release of Villa’s new monograph, Carlos Villa and the Integrity of Spaces, edited by Theodore S. Gonzalves. In the late 1990s I vividly recall visiting a class at UC Berkeley to show my work, after which one of the students, a nice Asian American kid, came up to me and said, “I really liked your videos, but are you really interested in all of that identity stuff?” Nearly 15 years later, my students at SF State see Jabbawockeez, and Harry Shum Jr. on their Tivo all the time, and Far East Movement is topping the charts, yet simultaneously they’re dealing with Hollywood’s stubborn refusal to abandon whitewashing (Akira, anyone?) and the teabaggers retro-paranoid siege mentality, while some people continue to deny that Mickey Rooney’s yellowface turn in Breakfast At Tiffany’s is racist. So I’m not completely convinced that identity politics are obsolete, and I’m happy to see young artists of color still examining issues of race, culture, and representation. Two recent San Francisco shows look at Multiculturalism 2.0. Intersection 5M’s newest show, Chico & Chang: A Look at the Impact of Latino and Asian Cultures on California’s Visual Landscape, deals with this crazy transitional time we’re living in, examining the inexorable demographics shifts in this country and the unexpected ways that U.S. culture is changing to reflect that shift. Organized by Intersection’s indomitable visual artists program director Kevin Chen, this chock full of energy and good information and includes several choice tidbits that bring multiculturalism into the current millennium. Right up front is Pablo Christi’s clever and arresting Hipster Pig. 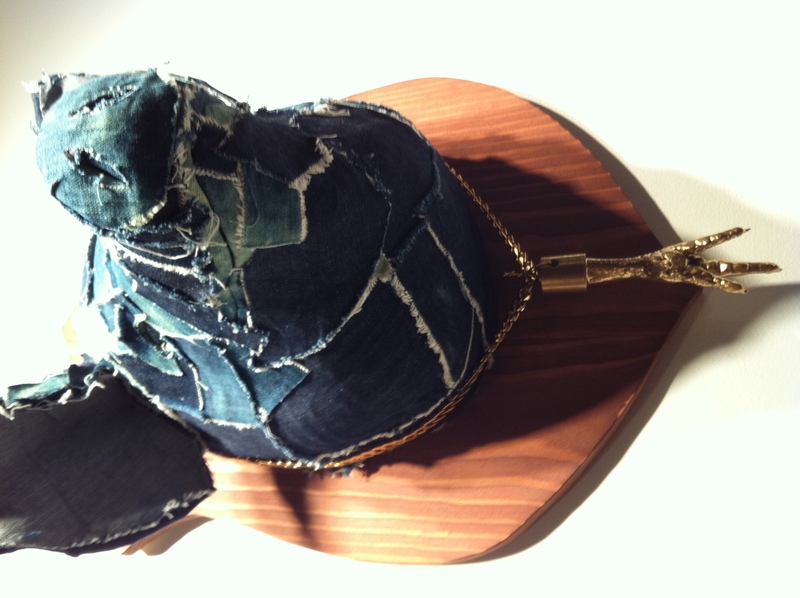 A life-size mounted patchwork denim hog’s head with gilded chicken-foot necklace, Christi’s sculpture critiques the new snout-to-tail foodie movement that fetishes consuming every bit of the butchered animal. I immediately recognized the chicken foot adorning the pig’s neck since my dad loved sucking down those bones long before Anthony Bourdain made it trendy. Likewise my grandmother’s stockpot was full of necks, wings, feet, and chicken heads, which horrified her grandchildren but made for excellent soup. Who knew that she and Pops were such culinary trailblazers? I’m sure they was just trying to save a buck, whereas the foodies that Christi critiques are making bank selling bone marrow and fish cheeks to gullible upscale consumers. Funny how poor people eating fish stomach don’t make it onto The Food Network very often. 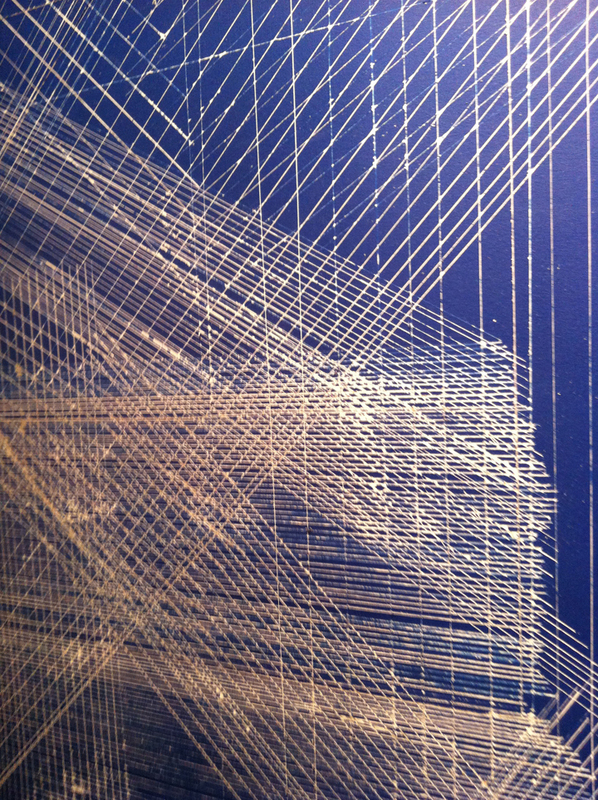 Ana Teresa Fernandez’ installation Carry On possesses an immediate visual appeal. 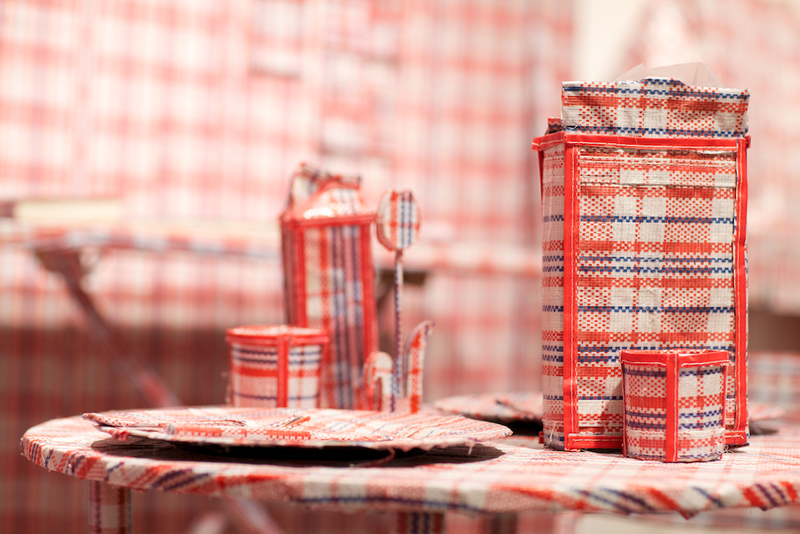 Fernandez has created a kitchen tableau with all objects, including floor, walls, furnishings, food packaging, clothes, ironing board, and crucifix, covered in the fabric from the plaid plastic shopping bags usually found on the arms of the ladies on the 30 Stockton and the 14 Mission. Not unlike applying an “ethnic plastic bag” filter onto a photoshopped picture, the immediately recognizable pattern of the installation’s surfaces cleverly underscores Chico & Chang’s curatorial premise. By pointing out the ubiquity of said plastic bags in both Asian and Latin American communities, Fernandez’ project speaks volumes about the Asian/Latino cultural intersections and iterates Asian and Latino influences on U.S. culture at large. Charlene Tan’s Silent Labor investigates a more poignant topic, examining an overlooked aspect of immigrant life in the U.S., as well as the global impact of our hyperconsumerist society. When I was 14 a family friend gave us an old traditional Chinese-style table. We swooned because my family had just bought a new home and we needed furniture. As we unpacked the table piece by piece my younger brother and I noticed handprints in dust on the finished surfaces. Thinking nothing of it, we chirped about the small size of the hands, thinking it was an errant child playing in the storeroom. Then, we saw small handprints in wood stain and shellac. Our hearts sank when we realized the hands smaller than ours built our table. Silent anger laced with guilt took over; we could be these unknown workers. 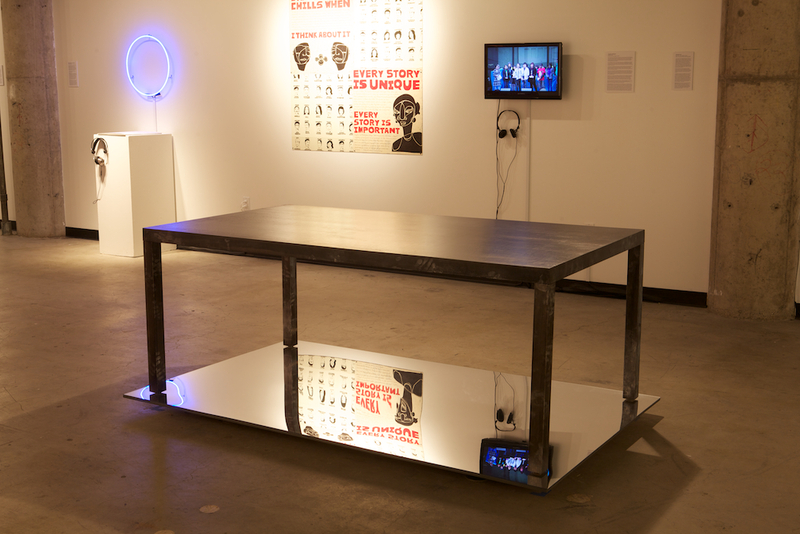 In her piece Tan references this experience, replicating a black IKEA-style table under which she has placed a large mirror. Nothing amiss is evident on the tabletop, but below, visible only in the mirror’s reflection, are small handprints on the underside of the table. Tan’s piece is a subtle commentary on the hidden human cost of the cheap imported goods that power the U.S. economy. Just up the street at Catherine Clark Gallery, Stephanie Syjuco’s “RAIDERS: International Booty, Bountiful Harvest (Selections from the A_____ A__ M_____), is an outstanding prank on art collecting, orientalism, and intellectual property. 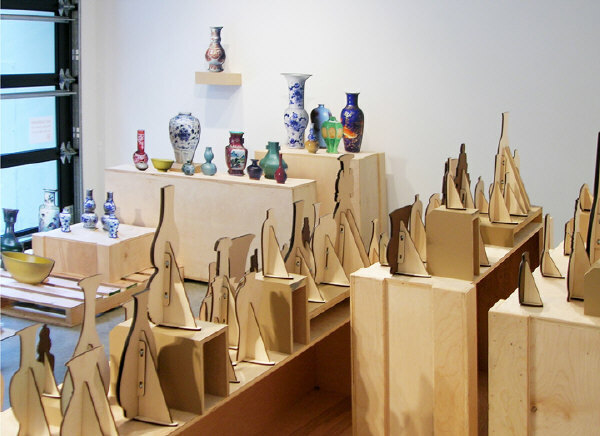 Syjuco downloads reproductions of collectibles from the Asian Art Museum’s website, blows them up life-size, and mounts them on propped-up plywood backing. Her sly commentary is simultaneously visually appealing, intellectually stimulating, and culturally relevant. As a refugee of 1990s multiculturalism I’m glad to see both Chico & Chang andSyjuco’s work moving the practice forward. Both shows forgo being simple cultural celebration or definition in their astute, relevant, 21st century views of racial and cultural representation.